Swim With Dophins- Bay Of Islands. How can you come to the Bay of Islands and not swim with the dolphins? This educational and fun for the whole family trip is a must do for anyone travelling through the area. There are a number of different companies offering this trip all with different options to cater to your wants and needs. 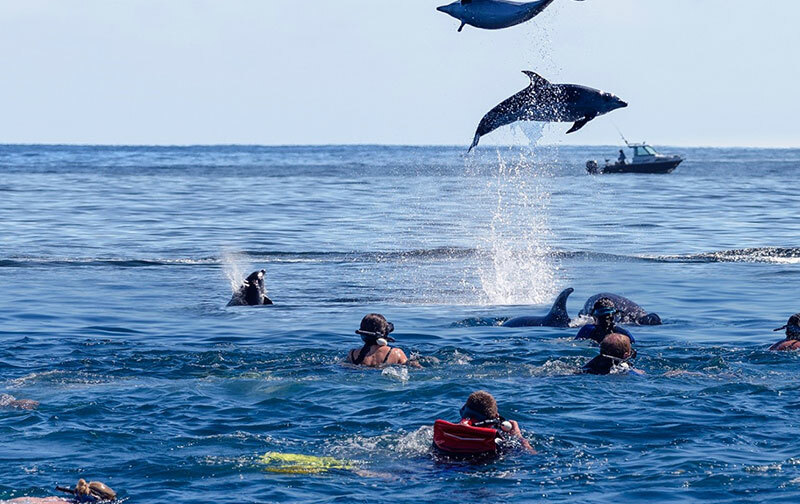 Usually swimming with the dolphins is an extra charge on a day trip and this charge is fully refundable if you do not swim. It is always dependent on the chosen operator but trips are usually available between the 1st of October and 31st of April. Swimming can be arranged outside of these times you just have to be a little more patient. Take with you your swimming attire (togs in NZ), plenty of sunscreen, hat, towel, a camera, and a thirst for adventure. It’s advisable to go on the cruise with your swimming attire under your clothes; you don’t want to miss the action because you were in the toilet getting changed. There are a few restrictions on what can and cannot happen when swimming with the dolphins. Remember they are a wild animal and we do not want to harm them in any way. The Department of Conservation has rules and regulations and these will be adhered to at all times. I have never heard anyone not happy with their trip so what are you waiting for?? ?